Children's toys for girls are required to be selected accordingly with their age. In this article, let's look at the favorite toys for girls of 8, 9 and 10 years for 2017. See also, favorite games boys aged 8-10 years. 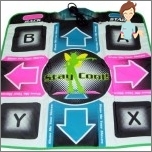 Dance mat «Pump Plus» for young dancers - this is the standarddance mat, which is ideal for home use. Options in the mat standard - program Russified software and colored Russian-language instruction. In the TV game has 168 dance compositionsThat will allow little girls to have fun, without using a computer. Soft tab of spongy material made comfortable mat for the feet. Estimated Price mat: 2700-3000 rubles. Winx Fairies for girls 8-10 years old - a real treat. Winx Fairies will give your child the magic! The most fun, energetic and professional program, remarkably beautiful and luxurious costumes witches attached! Winx Fairies, like all the little girls in your imagination create an ideal world in which dream and visit. Fairies Sorceress will surprise your baby dance master classes, production figures of the balls. Estimated price: 2000-2200 rubles. Hairballs (Flufflings) - Cute and funny furry animals for girls! They like to tumble, and they will happily giggling when your little girl will throw them into the air! They are always ready to play with the baby day and night! Hairballs is - Mindy (Pink) Okki (purple) and Loco (blue). The approximate price of the 1st hairballs: 1100-1500 rubles. Children's toy Zoobles with lock for girls 8-10 years old. What girl does not dream to be in a fairy tale? Zoobles lock that can realize this dream! It is a beautiful building bright pink with turrets, venue for the ball and the bridge. Remarkable inhabitants of the castle is always happy guests. The approximate price of children's toys: 1100-1300 rubles. Set Kitchen Center for your baby. Any girl in my childhood trying to copy my mom, so this kitchen play set is always required. In itself it includes everything you need so little mistress. Game themed kits facilitate the social adaptation of the baby, getting skills, moreover, just a lot of fun and entertain. Kitchen with accessories consists of 20 items. The approximate price of the set: 1900-2100 rubles. Casket divination for girls from 8 years. The game of divination has always been popular among girls 8-10 years, and not just before Christmas and New Year. In the "casket of divination" contains all the necessary for divination on grades in school, on her spouse, mummers and all that can be expected in the future. The values ​​of the cards are written in their own,so it does not need to memorize anything, it will make the process of divination available every girl, and in the company of her friends she will not be difficult to be a pilot prophetess. The approximate price of the casket of divination: 500-800 rubles. Sylvanian Families: Big House for girls. 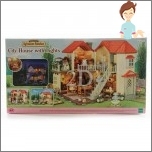 Children's play set "house with light" - it is a beautiful house, where will certainly enjoy live furry animals. On the front side of a spacious two-storey house appears eyes huge structure with a large balcony on the second floor and opened the front door. To get on a balcony can be both inside the house and outside - for special ladders. The approximate price of the game set: 2500-2800 rubles. Dressing table with accessories for true fashionistas 8-10 years. 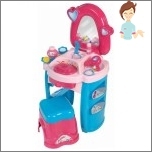 Sitting in front of a huge mirror, your little girl will be able to make original hairstyles, imitating their fairy, because for this purpose there accessories and hairbrush. You can add and its accessories in a special box on the shelf. Then just opportunities to grow! Estimated price table: 2500-2700 rubles. 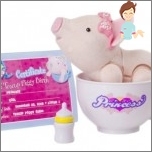 Piggy-cuties in tea cups for your baby. Piggy-cuties - a new interactive version of toys, the characters of which are charming mini-piggy. Newborn mumps are so small that they live in tea cups. They need constant attention and care of the hostess. As soon as the little ones grow up, they can be brought out into the light, dressed in beautiful clothes. In the series Piggis-cutie contains a collection designer dresses for little animalsThat will make the game much more interesting. The approximate price of a pig: 700-900 rubles. Plush Chihuahua dog in a bag for girls under 10 years old. Chi Chi LOVE - A few tiny dogs with a variety of accessories. The little fashionista will be able to select each of them and carry them with you everywhere, accompanying him to the bag. Wardrobe dogs It includes outfits for all occasions of their lives, as well as a huge number of beautiful accessories. Approximate price dog: 1800-2000 rubles.